A 2014 study evaluated the effect of the daily consumption and/or application of Argan Oil on skin hydration and age in postmenopausal women. “consumption of Argan Oil led to a significant increase of gross-elasticity of the skin, net elasticity of the skin, biological elasticity and a significant decrease of RRT – (resonance running time – a measure of skin elasticity). They also found that using Argan Oil led to a significant decrease in transepidermal water loss and a significant increase in water content in the epidermis. The Cause of Skin Aging at Menopause? 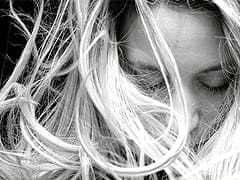 The cause of skin problems, as well as some other symptoms at menopause, is the reduced levels of the hormone oestrogen. The reason why this is significant is that oestrogen acts as a powerful antioxidant and is involved in many processes in the body. It supports collagen production and skin fibre generation. As oestrogen levels go down skin elasticity, which is the main sign of aging, also drops. The changes in skin also lead to other symptoms such as skin dryness, burning sensations, itchiness, blotchy skin and rashes. Your skin is made up of two layers. The lower inner layer, the dermis, is made up of fibroblasts that produce the collagen and elastic fibres that allow stretching to take place. This is what gives skin its elasticity. The decrease in collagen levels can be as high as 30% during the first 5 years after menopause. That is a decline of 2.1% per post menopausal year over 15 years. This decline in collagen also accelerates other degenerative changes and leads the other post menopausal symptoms such as break-out skin, acne and blotching. Oestrogen is a natural antioxidant that is central to protecting the skin renewal process. When oestrogen levels drop this leads to an increase in reactive oxygen species. The increase in reactive oxygen species causes an imbalance in the synthesis of “transforming growth factor-beta” (TGFß). 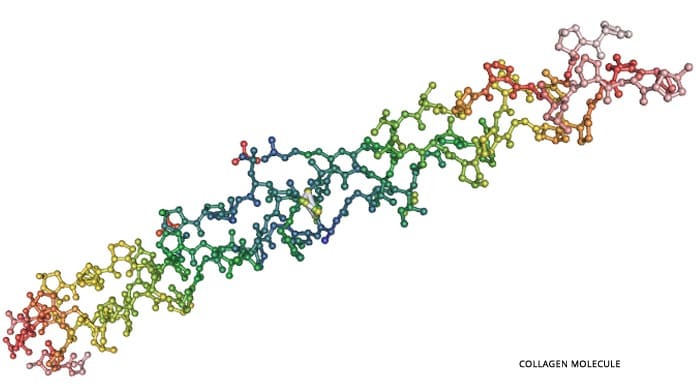 It is this small protein that is involved in the activation of cell growth, collagen and elastic fibre production. It is also connected to other important processes linked to cancer. This imbalance also favours the activation of metalloproteinases (MMPs) which further degrade collagen and elastic fibres. It is clear then why oestrogen replacement therapy can have a beneficial effect on the signs of skin aging. It maintains skin elasticity in post menopausal women by keeping up levels of the anti-oxidant hormones. However, there is some concern over side effects from the long term use of hormone replacement therapy. So, discovering a natural way to help protect the production of collagen and skin fibre through diet and skin care changes is desirable. Scientific studies had already confirmed that the consumption of culinary Argan Oil, combined with external application of cosmetic Argan Oil, is effective for slowing or reversing the symptoms of skin aging at menopause. So, it is interesting to note that these diseases have higher incidence in Post Menopausal women . 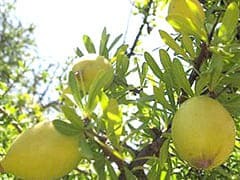 It would seem likely that the metabolic pathway that leads to these diseases – that we know can benefit from Argan Oil supplement – might also be connected with the loss of collagen and fibre production in the skin? A study was conducted with a group of 60 Post Menopausal women to observe the effect of daily culinary Argan Oil consumption in the diet and/or the application of a cosmetic Argan Oil for skin care. Research was only concerned with measuring improvements in skin elasticity ( age ) and not with other problems and changes to post menopausal skin. The study was divided into two groups of 30 women and lasted for 60 days. During the study none of the subjects were allowed hormone replacement therapy, or to use other anti-aging products or vitamin supplements for skin. 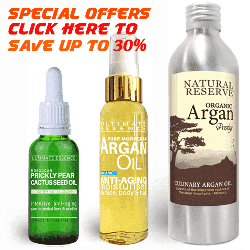 Culinary Argan Oil was consumed as a dietary supplement by a group of 30 women at 25 ml/day. A different, but also highly beneficial oil for skin, Olive Oil, was chosen for the control group. The control group of 30 women were given 25 ml/day of Olive oil. 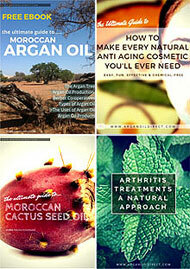 Both of these groups used cosmetic Argan Oil on their skin every night. Researchers noted that the test group who were eating culinary Argan oil as a food supplement, and also applying cosmetic Argan Oil externally to their skin, had the greatest improvement in skin elasticity. The test group that was given Olive oil to eat and cosmetic Argan to apply saw no statistically significant improvement over the use of cosmetic Argan Oil alone. It is supposed that this result was due to the higher antioxidant content of Argan oil – which is nearly double that of Olive oil. The antioxidants are mostly vitamin E as well as polyphenols, especially phenolic acid ( ferulic acid ). Treatment with Argan oil supplement increased the levels of vitamin E in the bloodstream of post menopausal women. Much more so than Olive oil. Ferulic acid, present in Olive and Argan Oil component is a phenolic compound which prevents oxidation as it stays in the blood longer than other antioxidants. It is thought that the synergistic antioxidant effect of vitamin E and ferulic acid combined is key to the maintenance of skin elasticity. There are also two more important nutrients, sterols, called schottenol and spinasterol present only in Argan Oil. The effect of these on skin elasticity is unknown. We already know that Phytosterols in Soy can be metabolised in anti-oxidant oestrogen mimics but whether they contribute to the benefits of culinary or cosmetic Argan Oil for post-menopausal skin care is not known. It is likely that the effects of high levels of anti oxidants, that can affect cell growth signals, explain why there is a side-effect-free improvement in skin elasticity when taking eating Argan oil as a supplement. The anti-oxidants in boost the weakened anti-oxidant effect of oestrogen. The result is more messages to the cells fibroblasts to produce more collagen and elastic fibres. 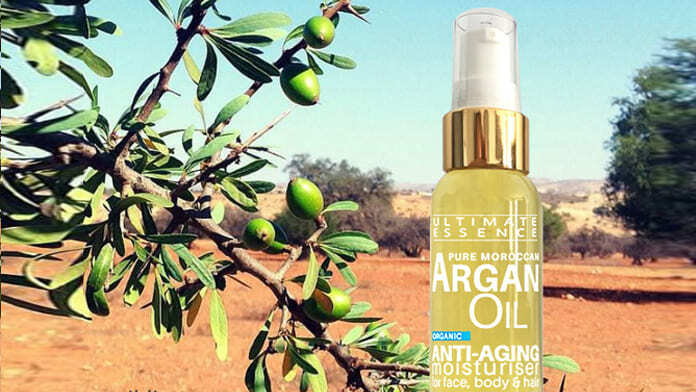 This research into Argan Oil uncovered the fact that aging in post menopausal skin is due to a process that could be slowed or even prevented by taking higher levels of anti-oxidants and in particular Vitamin E in the diet or by supplements. However, Argan Oil contains many complex nutrients with many known health benefits and it is quite likely that these also contribute to this effect. Anti-oxidants in isolation may not have the same effects. Both Soy and Tofu contains Phytoestrogens a plant derived Oestogen in the body rich in Isoflavones. In 2009 a study was undertaken with 30 postmenopausal women. They gave subjects 100 mg/day of isoflavone-rich, concentrated soy extract for six months..
To say how much cosmetic Argan Oil is needed for a 60 day course is difficult. It depends on the total area being treated. However, generally 1 x 65ml bottle of cosmetic Argan oil for external use should be sufficient for at least one month to 6 weeks. During the research a total of about 1.5 litres ( 25ml per day x 60 days ) of Culinary Argan Oil was eaten. This would require about 7 x 200ml bottles. 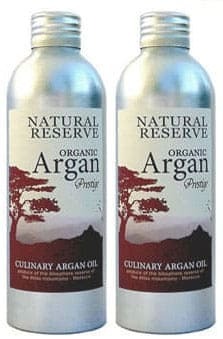 3x 65ml cosmetic Argan Oil + 7x 200ml Culinary Argan Oil. Prices include Fast & Free Delivery Worldwide. Berrougui H, Ettaib A, Herrera Gonzalez MD, Alvarez de Sotomayor M, Bennani-Kabchi N, Hmamouchi M. Hypolipidemic and hypocholes- terolemic effect of argan oil (Argania spinosa L.) in Meriones shawi rats. J Ethnopharmacol. 2003;89(1):15–18. Cherki M, Berrougui H, Drissi A, Adlouni A, Khalil A. Argan oil: which benefits on cardiovascular diseases? Pharmacol Res. 2006;54(1): 1–5.